Following a very disappointing General Election and the loss of good Liberal Democrat councillors in the Borough Council elections it would be an understatement to say things were not looking good for the Liberal Democrats as a party both nationally and locally, however we are glad to report that things have taken a dramatic turn for the better. Nationally the party has had over 15,000 new members since the 7th of May, and the local party is now rapidly approaching 90 members where before we were happy to be the right side of half a century! To add to this good news, the Newcastle-under-Lyme Liberal Democrats can also happily report that we have a new local councillor. Former Labour party member Cllr. David Stringer, who represents Ravenscliffe, has decided to cross the Borough Council floor to join the Liberal Democrat group, further allowing us to play our part in ensuring that Newcastle-under-Lyme remains a fair and tolerant place to live and work. A final bit of good news coming from the council group – Cllr. Ian Wilkes, our sitting councillor for Audley & Bignall End and former parliamentary candidate has been chosen to be the Deputy Mayor for the coming year. Yet another sign of the respect Liberal Democrat councillors, current and former, have across the Borough for their honest hard work and community focussed ethos. To all of our new members – welcome, we hope to see you at a social event soon. To those still wondering whether the Liberal Democrats are the party for them, please feel free to contact our membership development officer at membership@newcastlelibdems.org.uk. 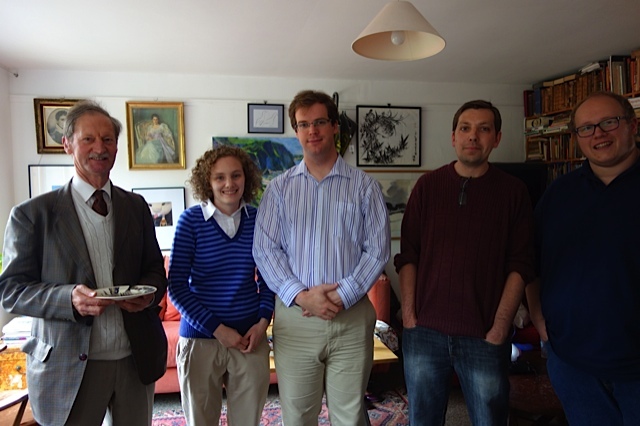 New Liberal Democrats with former council group leader Nigel Jones (far left) at our recent social event in Audley.